If you are bringing an Italian Greyhound into your home for the first time you may find our First Time Italian Greyhound Checklist useful. Its own bed – at least one! They are just the basics but of course the opportunities to pamper your Italian Greyhound are endless … throws on your sofa to mark your Italian Greyhound’s favourite spot, a bed in most rooms in your home because it’s easier than having to lug them around when your Italian Greyhound decides to follow you from room to room, toys everywhere – including impromptu toys such as socks and underwear that your Italian Greyhound has just decided to drag through the house! It’s not just enough to provide your Italian Greyhound with creature comforts and cuddles though. You must also make the time to interact with your Italian Greyhound e.g. by playing with him/her (at least twice a day for at least 15 minutes each time). Italian Greyhounds can be very naughty so you should also think about how dog safe your home is, or in this case how Italian Greyhound safe it is. Furniture in your home can be an Italian Greyhound’s idea of the perfect playground – the bookshelf the perfect place to practice a bit of mountain climbing, the back of your sofa the perfect place to practice carpet diving, kitchen worktops the perfect hunting ground … be aware and think about how you can ensure your Italian Greyhound can be stay safe in your home. Remember – Italian Greyhounds can jump, and they can jump very high! Italian Greyhounds have been bred as companion dogs for many centuries and as such they crave attention and interaction with their human owners. As a breed they are not suited to homes where the owners do not have time to interact with them regularly throughout the day, nor will they thrive if left at home on their own for long periods of time. In fact, an Italian Greyhound that doesn’t get enough interaction and psychological stimulation can quite easily end up being a “problem dog” – with the problem being caused by its routine and environment as opposed to an inherent psychological problem. It helps if at least one member of the household does not have to leave the home all day. That said there are of course many Italian Greyhound owners who have happy, healthy dogs who do work away from home all day. Important to note though is that almost all of these people make additional care arrangements for their dogs e.g. 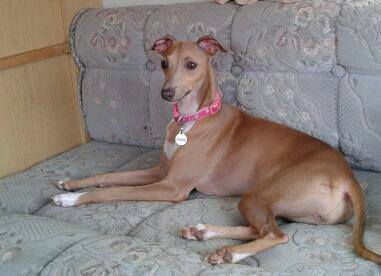 a friend / neighbour / dog walker / dog sitter visits and/or walks the dog during the day to ensure that the Italian Greyhound is not left on its own for too long a period of time. Opinions vary on what is ‘too long’ for an Italian Greyhound to be on its own. For the sake of putting a marker in the sand 4 hours is about the maximum length of time that most people would be prepared to leave their Italian Greyhounds on their own. This is definitely worth considering if you are thinking about an Italian Greyhound as a companion dog, especially if you have a busy work life or busy social life. Do you have someone you trust who you would allow to enter your home and take care of your dog unsupervised? Do you have the financial leeway to be able to hire a dog walker or dog sitter? Would it be easier for you to have a breed of dog that doesn’t require the one-on-one interaction that an Italian Greyhound does? With any household it is of course impractical to think that the family dog should never be left at home on its own. In fact this would not be healthy as a well-balanced dog should be able to be on its own for short periods of time without suffering from any stress or anxiety. When you do leave your Italian Greyhound at home for short periods of time, make sure it’s in a safe environment. As a puppy this can mean confined to a suitably sized play pen or crate (N.B. for short periods of time only – see the section on Crate Training), or as your Italian Greyhound grows older and wiser it may be that being restricted to certain rooms when you are out is appropriate. Never leave a young puppy to roam free around your home when you are not there to supervise.